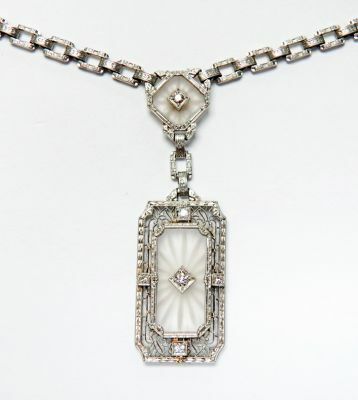 A beautiful Edwardian 14kt white gold necklace featuring 2 carved rock quartz, approx. 8.0x8.0x3.05mm - 19.0x9.0x3.45mm with 1 old European cut diamond, est. 0.05ct (clarity:VS & G-H colour) and 5 old European cut diamonds, est. 0.11ct (clarity:VS & G-H-I colour). The necklace is approx. 17.25 inches (43.82cm) in length.